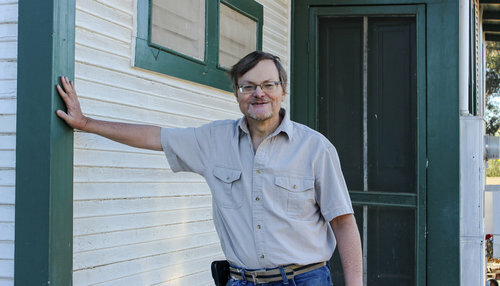 Former Interfaith shelter participant Brian poses in front of his new home. On this first episode of the podcast ‘Homeless in San Diego: Real People, Real Stories,’ host Greg Anglea, CEO of Interfaith Community Services, is joined by his colleague Victor Hernandez, Associate Director of Rapid-Rehousing and Shelters at Interfaith Community Services, to give listeners an overview of the realities of homelessness, what a typical shelter program looks like, and what other types of help may be available to individuals living in a homeless shelter. Greg and Victor are then joined by former Interfaith Community Services’ shelter program participant Brian, who shares what his experience living in a homeless shelter was like and how he, along with his cat Nala, found their way into a home of their own. Listen today by clicking here!